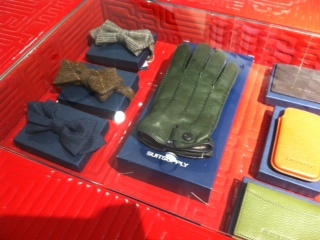 January | 2013 | The High Life Suite | Fashion. Food. Love. 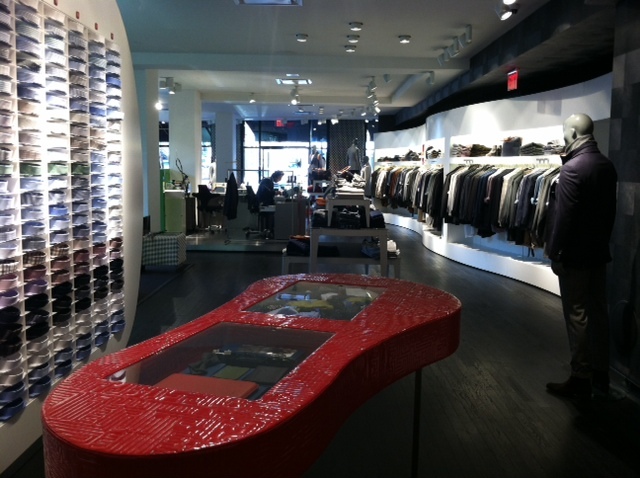 If you’re a DC based fella, have you heard of one of Geoorgetown’s newest shops Suit Supply? 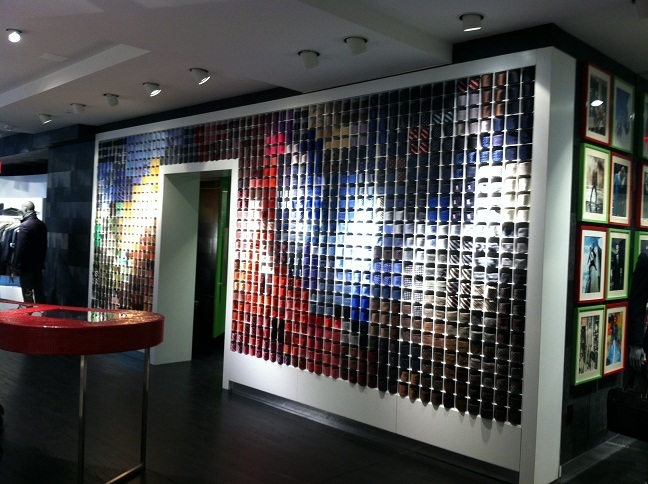 If the answer is “no”, I’m glad I can be the one to introduce you to this awesome men’s store! Say “bye-bye” to the days of being relegated to buying cookie cutter, boxy suits from department stores. 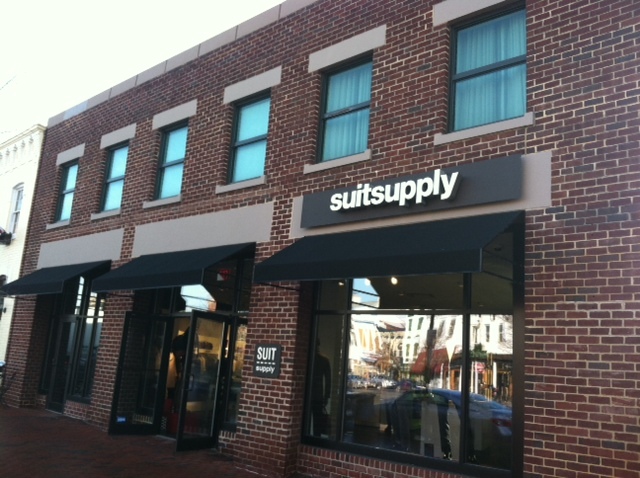 Based in Holland, Suit Supply just landed in DC at the corner of 28th & M Sts. NW. 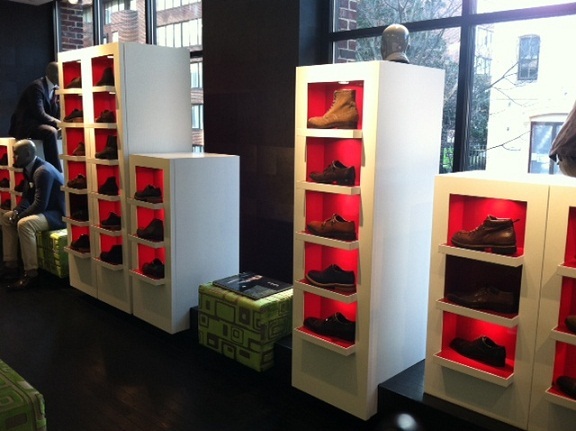 four months ago and is the 3rd US location for this Dutch men’s atelier. From the moment I walked in, my breath was literally taken away! Okay, I’m a little dramatic, but seriously I couldn’t help but smile from ear to ear as I walked through the door and took in the view. 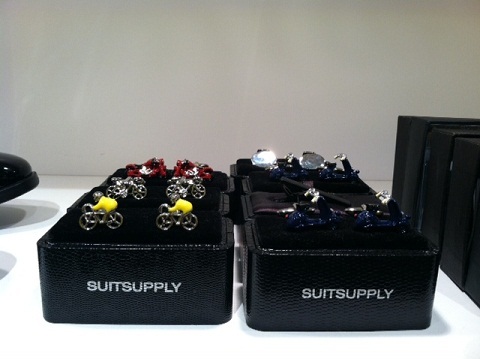 Suit Supply has everything! 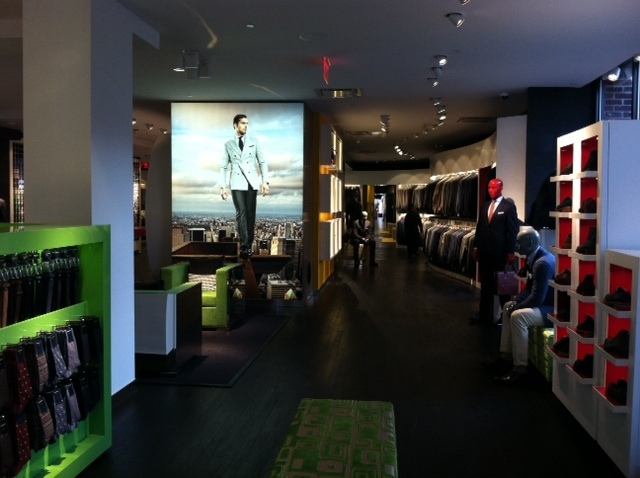 Casual wear is the first thing you see when you enter but the star here, as the name suggests, is the suit selection. 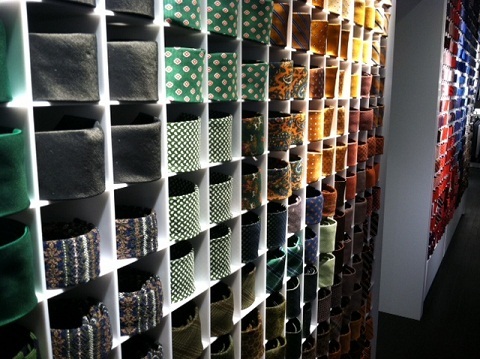 There are plenty of fabrications and colors to choose from. 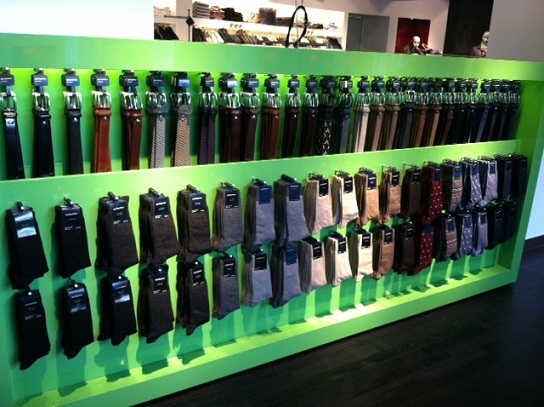 There are ties, literally a whole wall full! 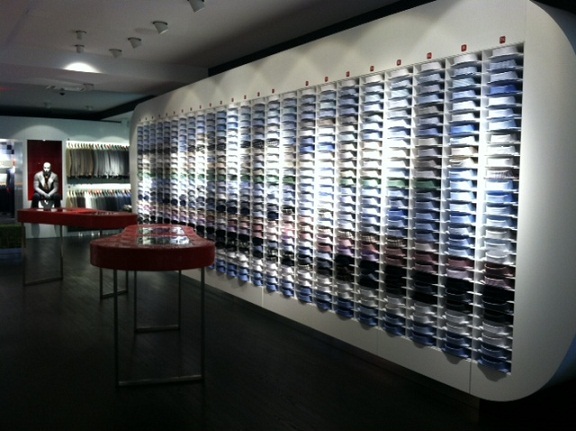 Dress shirts, perfectly arranged by size. 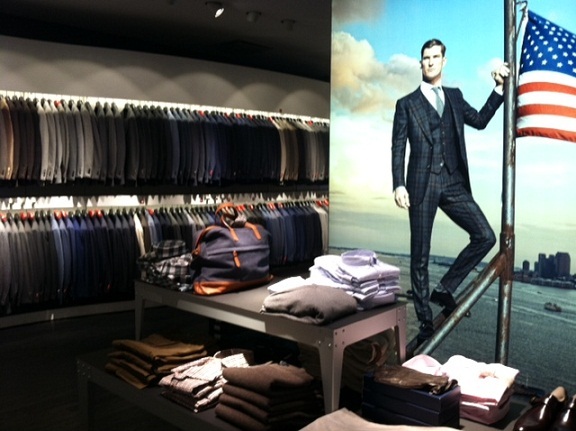 Even the store’s mannequins are a sight to see! 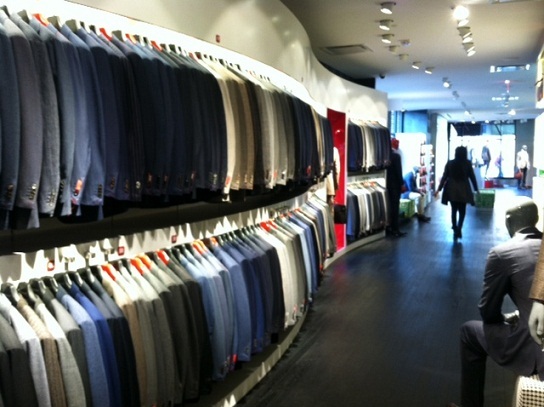 The most important attribute Suit Supply possesses and what I thought was the highlight of this shop is the on-sight tailor who was doing alterations as I toured the store. Next time you’re in the market for a new suit or anything for that matter, I suggest you take a trip down to Suit Supply and let their wonderful sales’ staff(special thank you to Josslyn & Kyle for entertaining all my questions!) 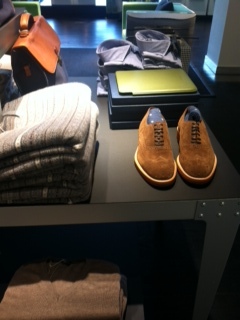 and let them show you all that this Dutch retailer has to offer. 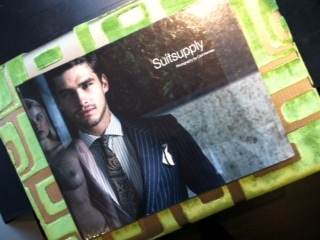 Have any of you guys visited Suit Supply?? As you are probably aware, cupid’s holiday will be here in about two weeks. If you haven’t started planning your Valentine’s Day already, I am here to help. Of course you can choose to do dinner and a movie, or roses and chocolates. But today, I’m providing you with a few unique options and ideas. You may chose to celebrate early and the perfect time to do that is during DC Restaurant Week Winter 2013. Beginning Monday, February 4 and ending on Sunday, February 10, you can dine at some of DC’s most fabulous restaurant with a prix fixe menu for lunch at $20.13 per person and dinner at $35.12 per person. So try a restaurant that wouldn’t be in your usual dining options. Get your spy on! The International Spy Museum is offering a “Double Agent Date” package every Saturday & Sunday in February (except President’s Day weekend). For $30, the package includes two tickets to the museum, a covert scavenger hunt and a spy-worthy photo of you and your love. Don’t tell me you love me, show me that you love me! What better way to do this than through art? The combination of painting and wine has become a thing to do. 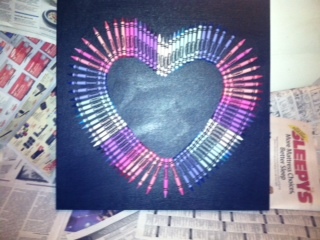 Not only can you enjoy wine but you can make and take home some nice artwork. 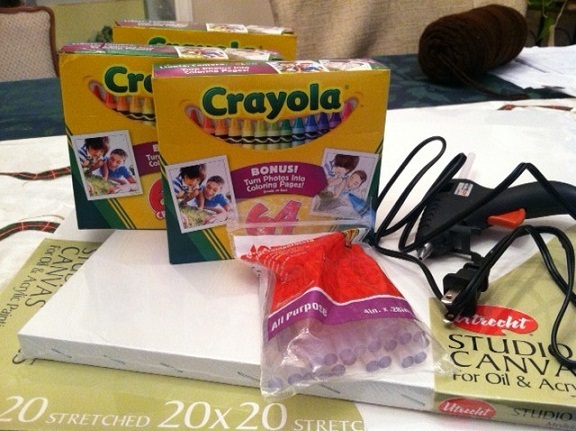 Deals for wine and paint classes can be found on many of the deals sites. (Just look.) 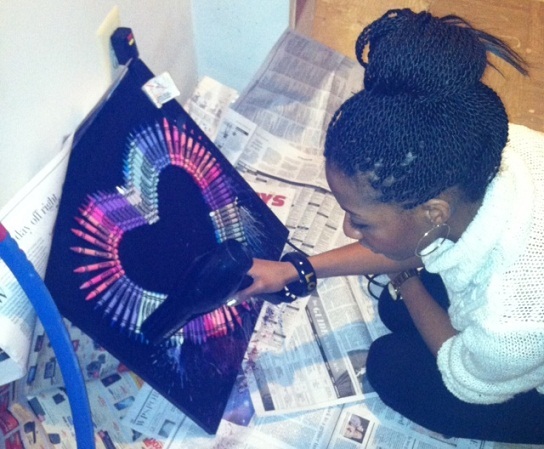 But here are a few locations to try: ArtJamz, Uncork’d Art, Brush N Blush, Merlot’s Masterpiece, Wet Your Palettes. Have a serious love for animals? Then Woo at the Zoo is for you and your boo! On Saturday, February 9, the National Zoo will provide opportunities to learn about animal dating and mating. Talks are at 4:30 pm, 6:30 pm and 8:30 pm. Tickets to the event are $30 for non-members and $20 for FONZ members and include: a commemorative Woo at the Zoo glass, one complimentary drink, complimentary hors d’oeuvres, cash bar featuring specialty drinks and the opportunity to decorate a sweet treat. Sometimes you just need to getaway from the hustle and bustle of city life. Plan a quick getaway or day trip to DC’s Wine Country, Loudoun. Stay at a bed & breakfast, enjoy Valentine’s Day events and sip wine by the fireplace at some of the local wineries. Looking for some other special things to do this Valentine’s Day? 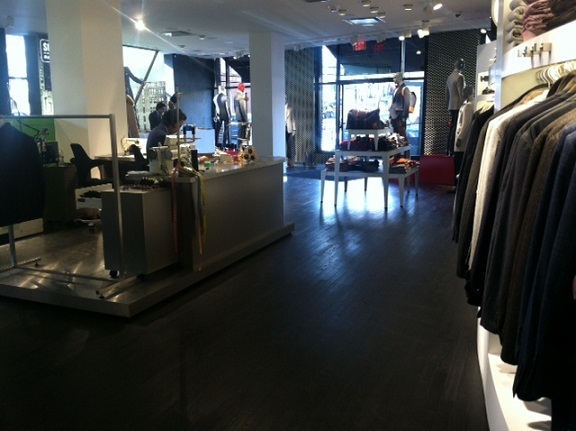 Check out Date Nights DC site for deals and discounts to celebrate love all month long. and wanted to figure out how I could make my own! 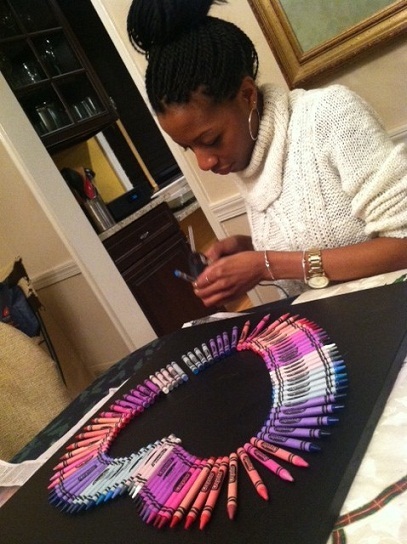 I did some research and found out that I could create such a piece using a stretched canvas, tons of crayons(seriously like 70), a glue gun and a blowdryer(yep a blowdryer, how crazy is that??)! I wanted the canvas to be black so I started by painting the canvas with acrylic paint that I had leftover from my DIY bangle project. 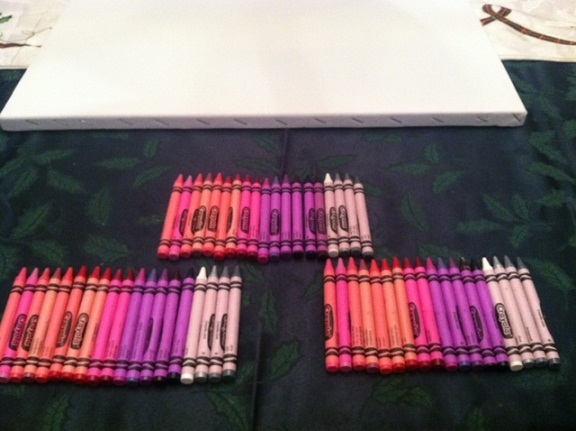 While the canvas was drying, I took the time to lay out all the crayons that I planned to use and create the color pattern I wanted. 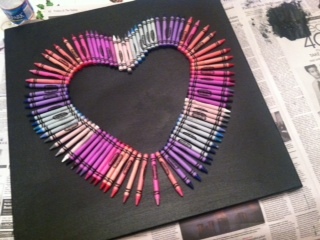 After the canvas dried, it was time to stage the crayons in the heart pattern. This step honestly took forever(I can bit a liiiittle bit of a perfectionist) and almost made me abandon the project, but I refused to give up! 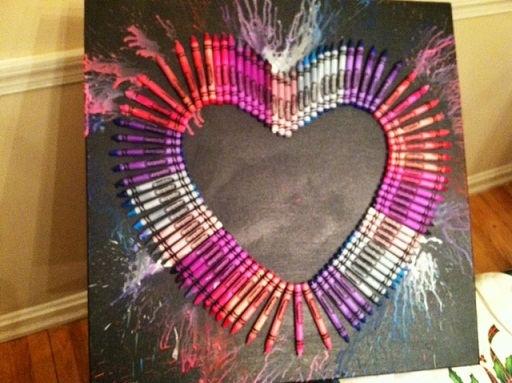 Once the crayons were laid out just so, I got my handy glue gun and glued the crayons in place. This next step can get messy, so if you’re going to try it, set up newspaper under and around the canvas to catch any splatter. 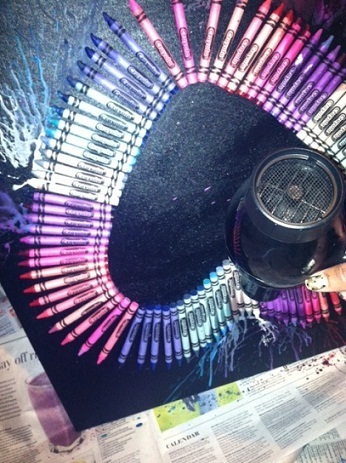 Lean the canvas against the wall and heat up that blowdryer! 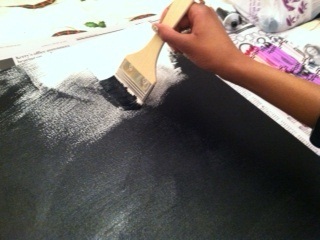 To get the splatter to go in the right direction, I had to keep turning the canvas so that the splatter went downward. 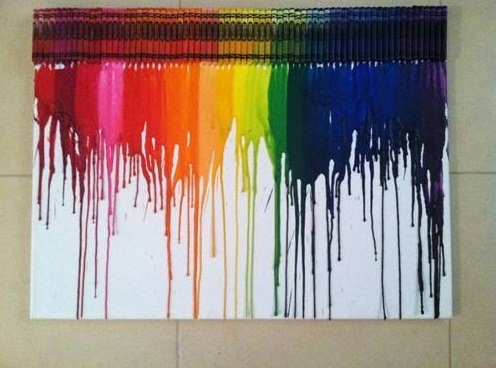 The length of time you’ll have to keep the heat on the crayons depends on the amount of splatter you want to create. The finished product!! 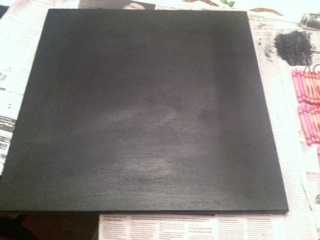 This project was much easier than I thought it could be, even though it is a little time consuming. And for my first time, i’d say I did pretty good! 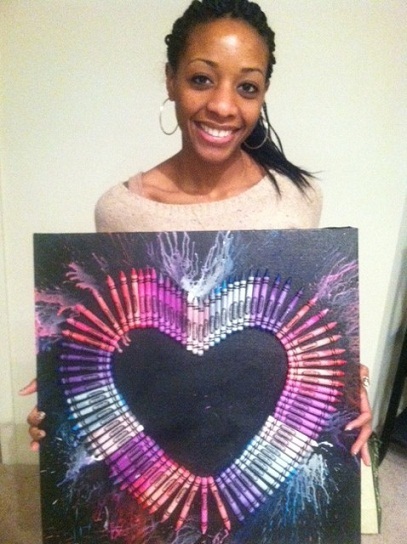 With Valentine’s Day just around the corner, this DIY artwork would be a perfect handcrafted gift! Keep that in mind folks! DC may not be Paris, London or Milan. Or even New York or LA. But I refuse to accept the horrid cliche that DC is “Hollywood for ugly people”. 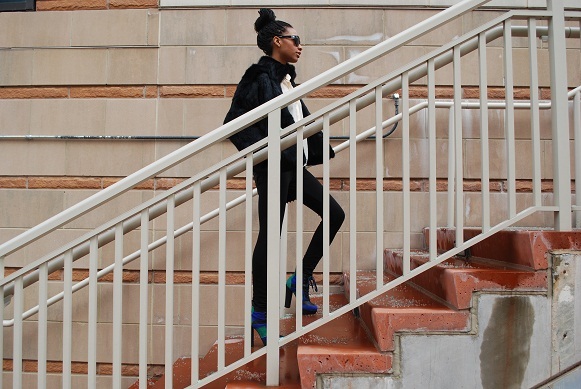 We’re not glitz, glam and breathtakingly short hemlines but we do have a fashion voice. 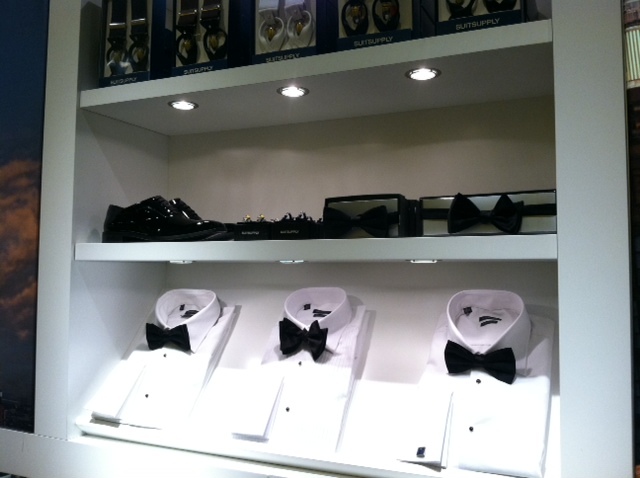 Yes, black and navy may be preferred over more cheerful hues but structured and well put together looks are a city fave. I LOVE fashion & style. Eat, sleep and dream it; so I see it at my civic duty to show you all that not only myself but also the rest of DC has definitely got style. Last week we had our first real snow of the winter season but I couldn’t let a little chill keep me down! I recently tried this new spot in DC called The Pinch. It’s located in the northern area of Columbia Heights on 14th Street NW. A dear friend of mine, Chontelle, decided we should try it out. She said she found out about them by doing a yelp search for duck and how much she wanted to spend. When I tell y’all how much I love duck, it really is one of my favorite things to eat when I’m out. So I was excited to see what The Pinch was about. So we got there and perused the menu. I saw that they offer my favorite wine brand, Cupcake Wine Prosecco. *Win* Although, I didn’t order it this time around, it is well noted for next time. 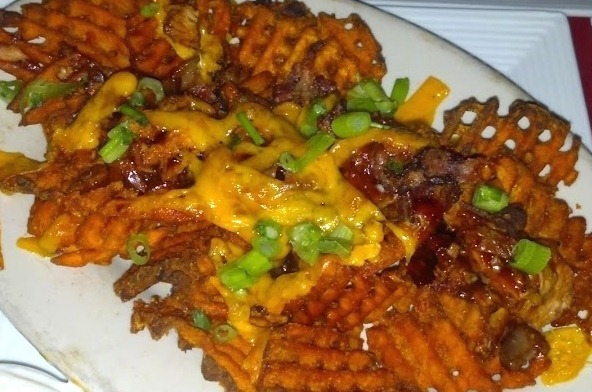 We decided to start with the Beer Loaded Sweet Potato Fries. The fries comes with pulled duck, bacon, seared scallions, cheddar and sour cream (on the side). Chontelle really enjoyed this dish. I liked it and would share it with someone again. My only negative was that the sweet potato fries were unusually sweet. And this sweetness made the pulled duck fight for my taste bud attention. Yes, I know you’re saying… But G, they are sweet potatoes. I get it and I’ve had sweet potatoes before and have enjoyed endless amount of sweet potato fries, but they were just a bit too sweet for me. But you try it and let me know your thoughts. For our meals, I ordered the crabcake sandwich and Chontelle got the meat lovers burger. 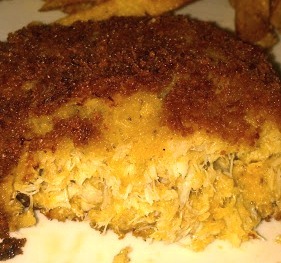 My pan-fried crabcake was tasty. Although it had filler, it was not a filler burger… you fellow crabcake connoisseurs know what I’ve talking about. It had good flavor and left me satisfied. 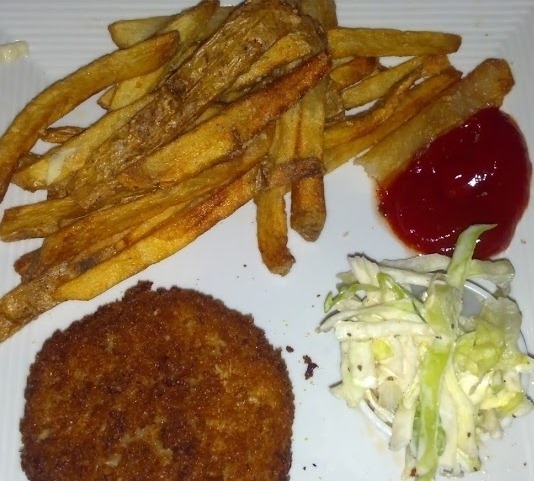 The crabcake sandwich was served with fries and coleslaw. Both which were enjoyable. Chontelle had the meat lovers burger which came with a beef burger, pulled duck, bacon, and cheddar. 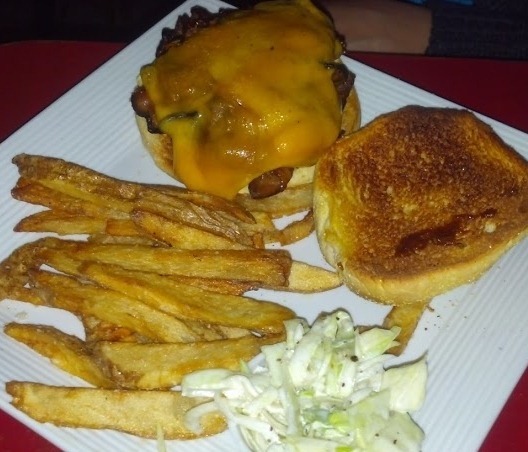 It was also served with fries and coleslaw. She really enjoyed this burger and described as very yummy and tasting similar to bulgogi mixing nicely with the saltiness of the bacon. I had to have a bite after hearing this. I agreed…it was pretty delicious. 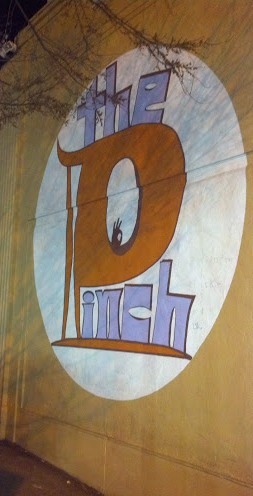 Overall, I enjoyed my experience at The Pinch. They also have a brunch which offers bottomless mimosas, blood marys or screw drivers. *Sold* I will definitely be back to see what their brunch is all about. If you’re looking for something fun to do, you can enjoy trivia at The Pinch on Wednesdays and Improv on Mondays featuring Burlesque & Belly Laughs. Burlesque and Improv sounds like a very entertaining and fun mix. So go see what The Pinch is like for yourself. Here is their full menu. Let me know what you think. 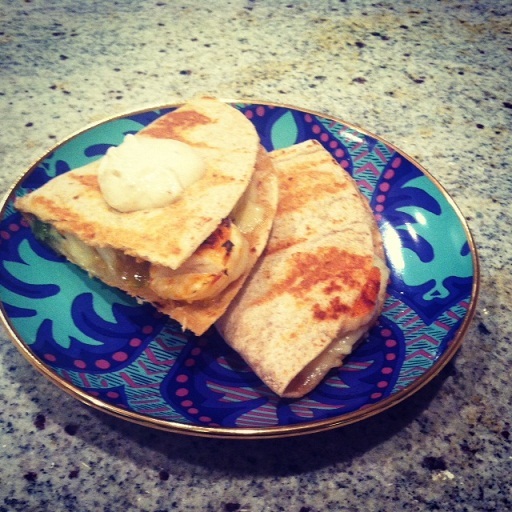 Recipe du Jour: Grilled Shrimp Quesadillas w/ An Ancho Chile Dipping Sauce! I love Mexican food and I love shrimp! So when I saw that shrimp was on sale at my local grocer, I couldn’t resist picking up a pound and doing something delicious with it. 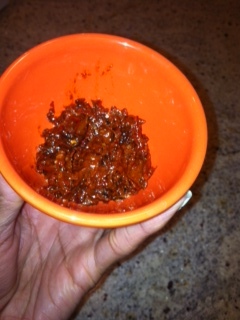 Let’s start with the ancho chile paste which will be used in both the marinade for the shrimp and the dipping sauce. Boil your three cups of water. 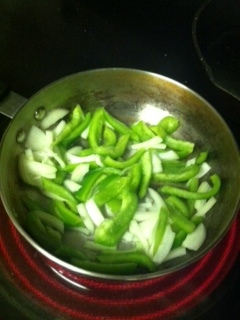 Once the water has come to a boil, completely cover your chiles and let them steep for 15 minutes or until softened. 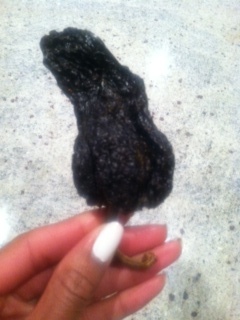 Once the chiles have softened, remove from the water, split downt he middle in order to remove the veins and seeds. 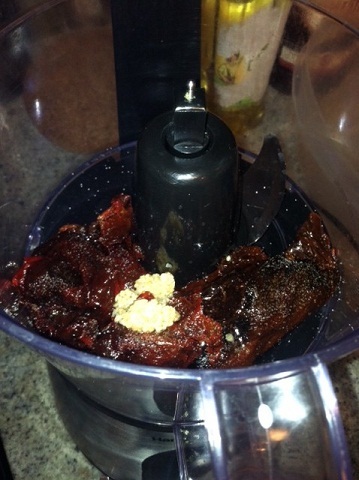 When the seeds and veins have all been removed, place the chiles, garlic, olive oil and salt in the food processor and pulse until a paste consistency is achieved. Set aside. Now it’s time to make your marinade for the shrimp. Combine all the above ingredients in a non-reactive bowl. 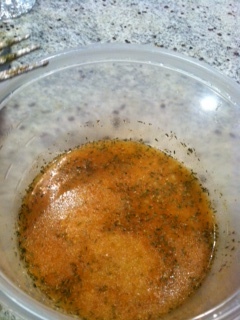 Add in your peeled and deveined shrimp once the marinade has been mixed together. 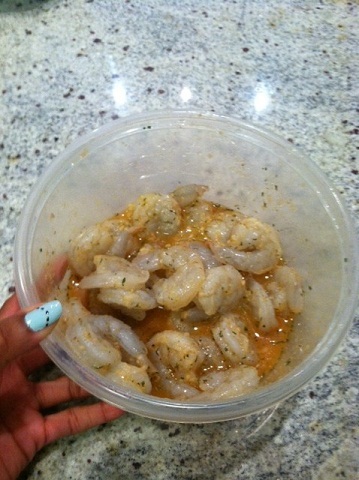 Let the shrimp marinate in the fridge for 2 hours. While the shrimp are marinating, prep the rest of your quesadilla ingredients. 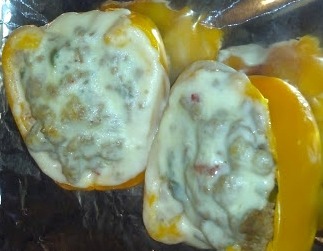 I decided to use a multigrain tortilla, manchego and Monterrey jack cheeses, and sauteed onions and bellpepper. *If you aren’t familiar with manchego cheese, you need to get familiar because you’re missing out! It’s a Spanish cheese made from sheep’s milk, with a distinctive yet understated flavor. 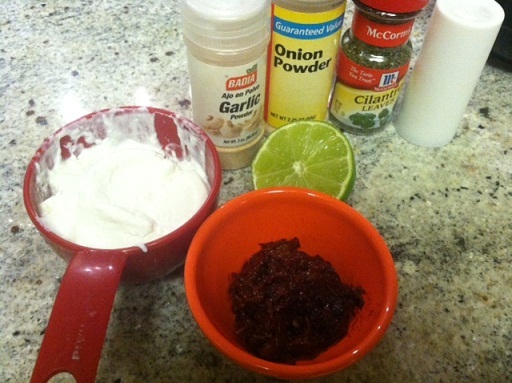 It’s tough to describe but it’s yummy and perfect for tacos and quesadillas. Combine all the ingredients above in a bowl and set aside in the fridge until you’re ready to serve. 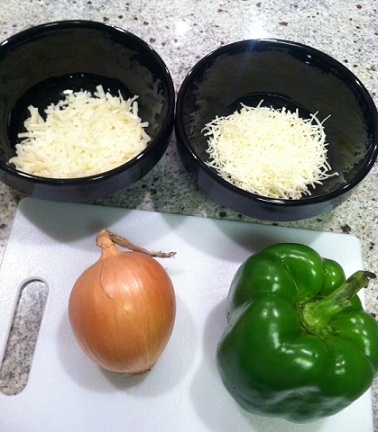 Now that we’ve got all of our different components ready, it’s time to assemble the quesadilla. 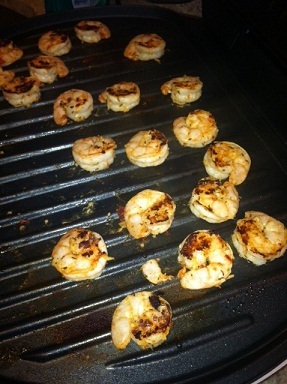 Use a countertop grill(or an outside grill if it’s warm where you are), such as a George Foreman to grill the shrimp. 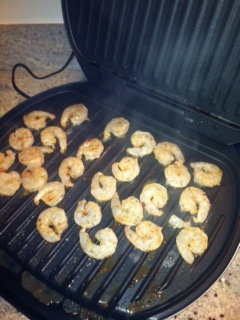 I literally put the shrimp on the grill, closed the lid and in 3 minutes they were ready! I’m so glad I bought this thing. 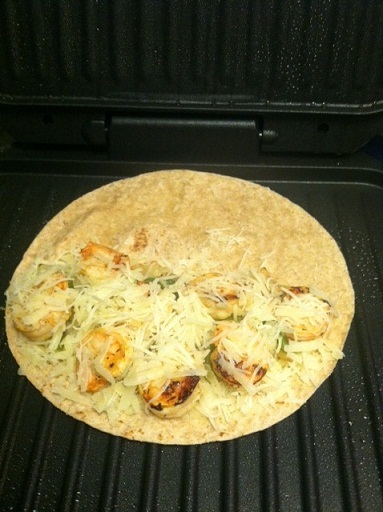 Get the multigrain tortilla, load up half of it with a layer of manchego and Monterrey Jack, top with your sauteed veggies, then the shrimp, followed by another layer of cheese and then fold over. Close the lid on the grill and allow the quesadilla to “cook” until the cheese gets nice and melty, should take no more than 2 minutes. but be sure to watch it. Top with a dollop of the ancho chile & Greek yogurt dipping sauce and serve! The Super Bowl XLVII is less than two weeks away and this girl can’t wait. I love Super Bowl party eats!! Dyanna and I love to cook and we’ve shared a few recipes with you that would be perfect for your Super Bowl party. Many of the dishes below are not only affordable to prepare, but also will allow you to feed large quantities. 2-3 tbsp of A1 sauce or your steak sauce of preference. 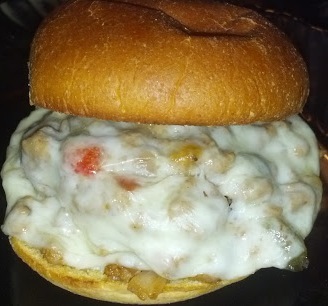 For this recipe, I used ground turkey because that’s what I was in the mood for. 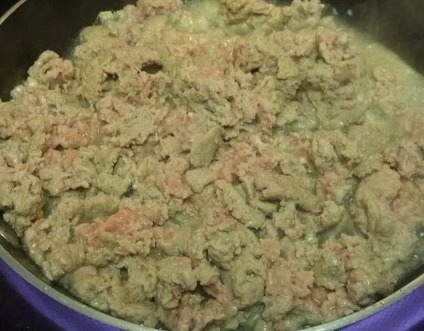 So you begin by cooking and browning the meat with a little olive oil. Do not drain the juice/grease. 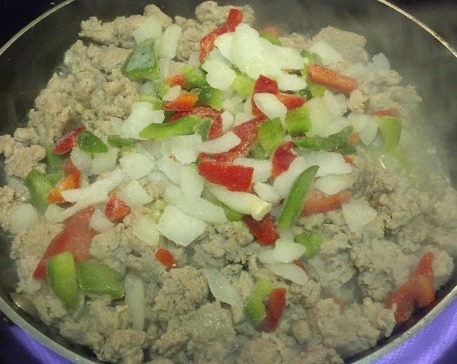 Leave it in the pan with your meat and add your chopped garlic and veggies. Cook until the onions turn clear. 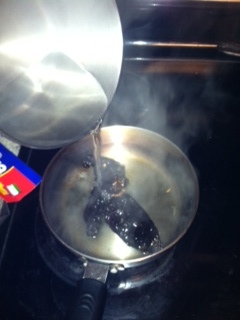 Then added your steak sauce and Worcestershire sauce. 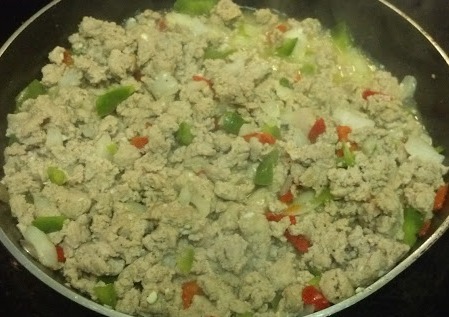 Allow the mixture’s juice to thicken a little by continue to stir on the flame. Next, add the mixture to the slider rolls. 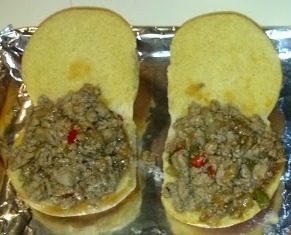 I also had a orange pepper on hand, so I decided to make a healthier version of the cheesesteak sloppy joes. Place your cheese on top of the mixture. 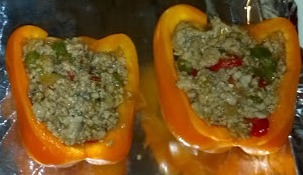 Place in the oven at 350 degrees for about 10-15 minutes. 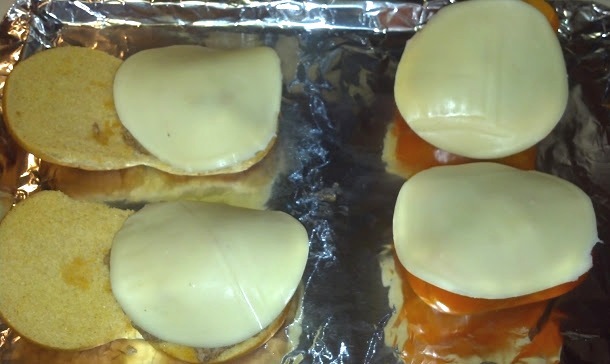 After the cheese has melted and browned to your liking, it’s ready to serve. 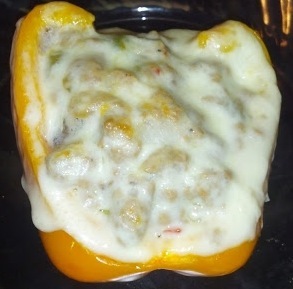 This recipe is so simple and quick to prepare. What will you be cooking for your Super Bowl party? Michelle Obama gave me SO much life in her Thom Browne structured coat and J. Crew bejeweled belt and purple gloves at the swearing in ceremony. My eyes literally popped open when I saw her! 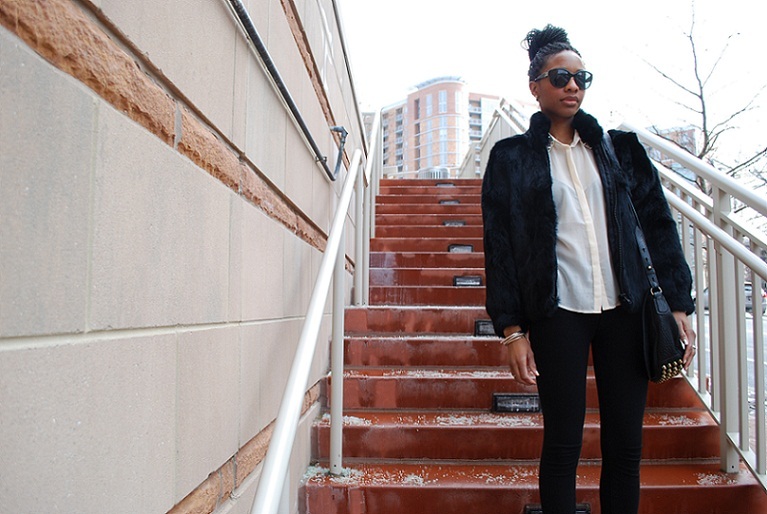 Even without the belt and gloves, I just love this coat! It actually looks like a dress. Who says that just because it’s winter, you can’t be stunning?? Pish posh! Now who is Thom Browne? I’m sure that’s the question on many people’s minds, it was honestly on mine so I did some research. 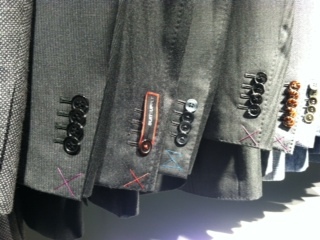 American born Thom Browne is primarily known for his menswear designs but designs womenswear as well. While mainstream America may not be familiar with Thom Browne’s designs, he was named as the CFDA menswear designer of the year back in 2006 and the GQ Designer of the Year in 2008. Learn more about the designer by visiting the brand’s site here. 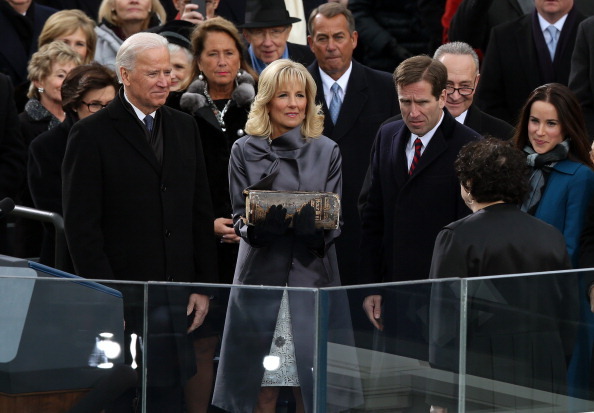 Dr. Jill Biden’s silver Lela Rose coat also caught my eye! The color and the big bow were my fav aspects. I’m a sucker for ultra feminine details! 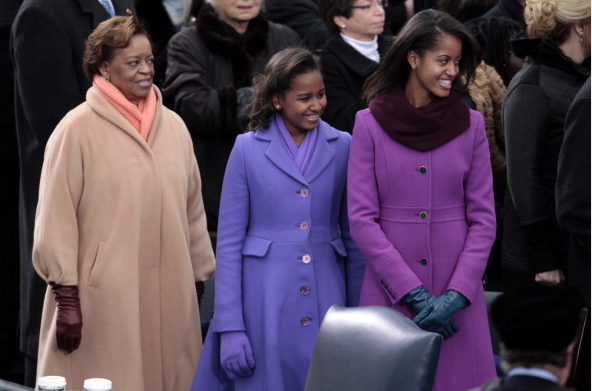 The Obama girls, or should I say, young ladies, were uber cute in their brightly colored coats and gloves! I still can’t believe how much they’ve grown since 2009. Malia wore this wool J. Crew coat in fresh plum. While Sasha looked absolutely adorable in a periwinkle Kate Spade coat. And just how chic did the girls look at Saturday night’s Kids’ Inaugural concert?? I also thought the First Lady’s fashion forward Alexander McQueen top with an asymmetrical hem was a bold yet fashionable choice. 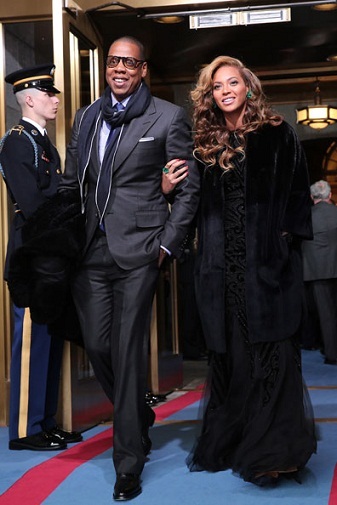 Another standout fashion sighting came from Jay-Z! 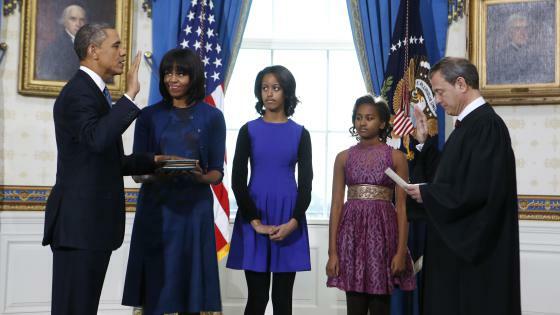 At Monday’s swearing in, he looked absolutely dapper in a Tom ford suit; fellas take note! 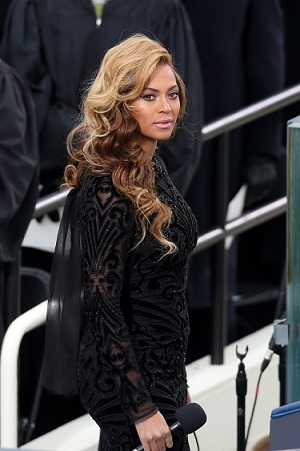 Beyonce’s makeup, hair and emerald accessories(hey Pantone color of the year!) were stunning but her choice of an Emilio Pucci formal gown, while beautiful, confused me. It’s clearly an evening dress being worn at 11am. Right dress, wrong time. 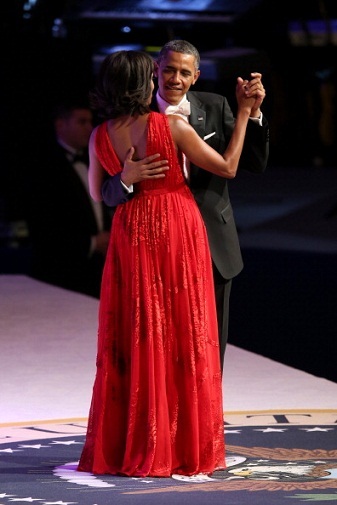 Monday night’s Inaugural Ball brought the moment everyone had been waiting for, the unveiling of the FLOTUS’ gown. 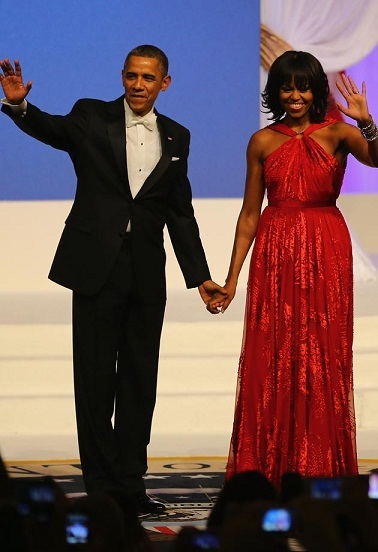 First, I must say that I love President Obama’s choice of a white bowtie! 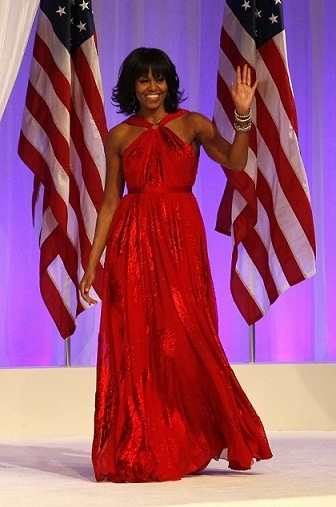 Mrs. Obama chose a design from Jason Wu for the 2nd time. 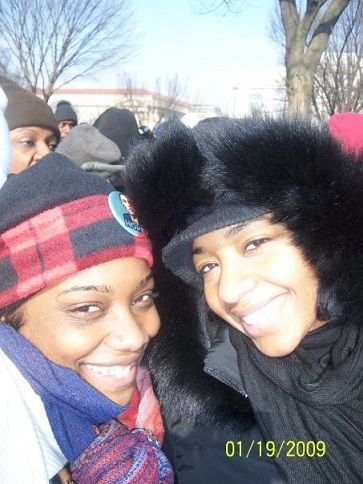 But anywho, that’s my take on 2013 Inaugural fashion! What’d you all think about the choices for this year’s ceremonies?? the city is packed with power players and celebs, Inaugural Balls/dinners/parties are happening all across the DMV and did we mention that traffic is a nightmare!? 1. Dress warmly!!!! I can’t stress this enough. When you think you’ve put on enough layers, add another. What seems bearable when just walking from point A to point B can become downright torturous after being outside in near freezing temps for hours. 2. Plan your travel route carefully. There are tons of street closings downtown as well as Metro station closings. Check here for the list of closed Metro stations. And check here for the list of street closures and parking restrictions. Read carefully, the list is massive. 3. Bring water and snacks. You’ll be out there for hours and everybody knows that these types of occasions bring out vendors who will often overcharge. It’s just the basic law of supply and demand. I would however, also recommend trying one of the many food trucks that will be dotting the ceremony area from across the country. District favorites who will be in attendance include our fav Goodies Custard, Fojol Brothers, Carnivore BBQ and Capital Chicken & Waffles. 4. Take tons of photos and cherish the moment! 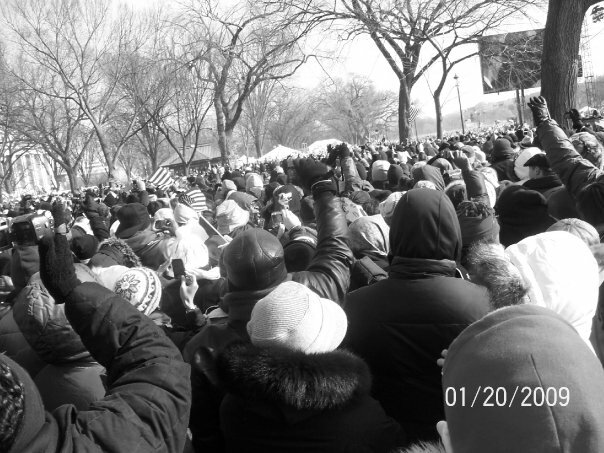 I went to the ceremony in 2009 and to say it was an unforgettable experience is an understatement. 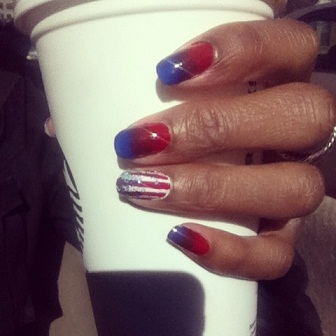 Thousands of people will be out celebrating President Obama’s re-election and feeling uber patriotic. Make a new friend and relish in the experience. I promise you’ll never forget it! 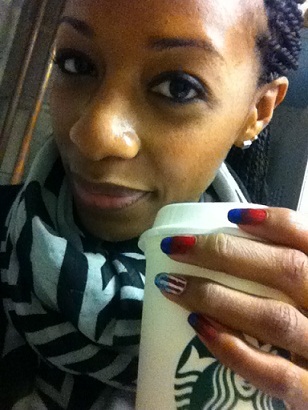 Naturally, I had to pay my respects to this momentous occasion with a patriotic manicure. 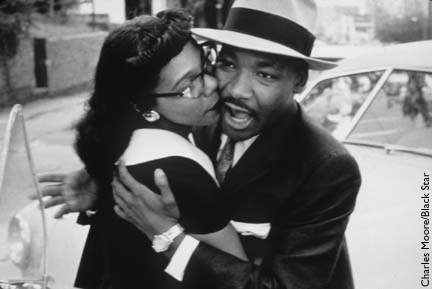 And before I close out this post, I have to also say Happy MLK Day!! 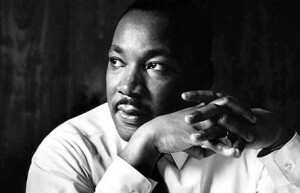 Martin Luther King Jr. would have been 84 years old this year! I happen to have a thing for lemon desserts. I absolutely love lemon! Recently, I had a craving for something lemony and sweet. So I decided I was going to make some lemon glazed cookies. I used my girl, Martha Stewart’s recipe and they came out delicious! Now I will put this disclaimer out there… when I want the cookies, I wanted something I could prepare fast. So I used store brought sugar cookie dough. The cookies still came out very tasty, but next time I think I will make my own cookies as well. 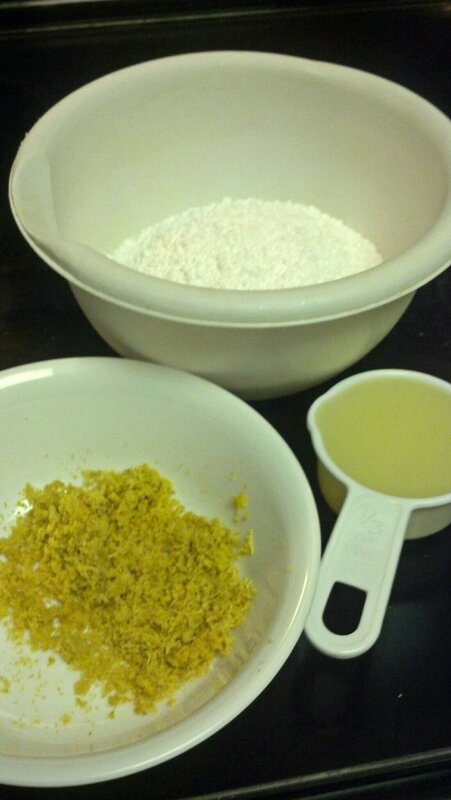 The most tedious part of this recipe will be using a grated to get the lemon zest. I ended up using a whole bag of lemons in order to get my two tablespoons. 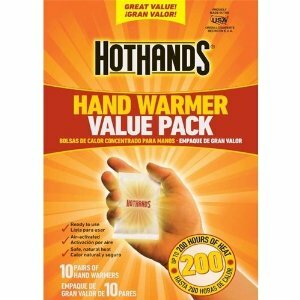 Preheat your oven as the cookie instructions require. 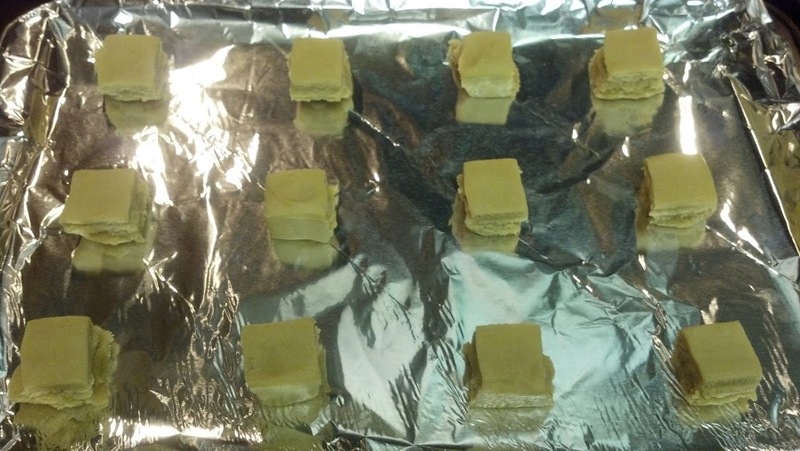 Place your cookie dough on a cookie sheet. 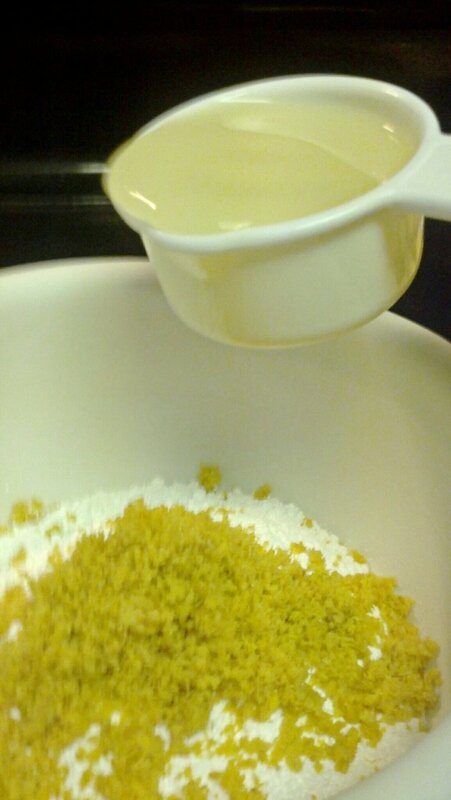 While the cookies are baking, mix the powdered sugar, zest and lemon juice all together. Stir until everything is mixed well and you have a thick syrup like consistency. Take cookies out of the oven (per time instructions) and allow them to cool. 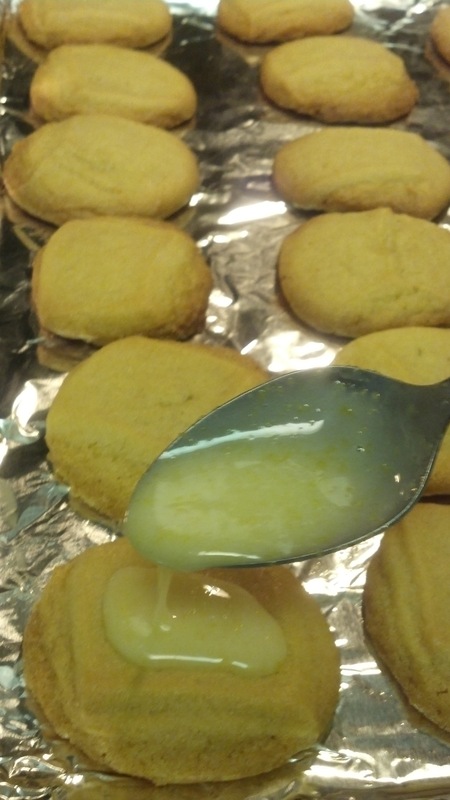 Once they have cooled, spoon the lemon glaze onto the cookies. I ended up doing this twice. I spooned the glaze once and let it sit and cool for a few minutes. Then I went back and added more glaze and allowed the glaze to set. After my glaze was set, I tasted the cookies and they were just sooo yummy. 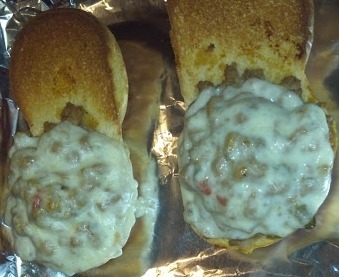 This recipe was fairly easy, so I will definitely be making them again. 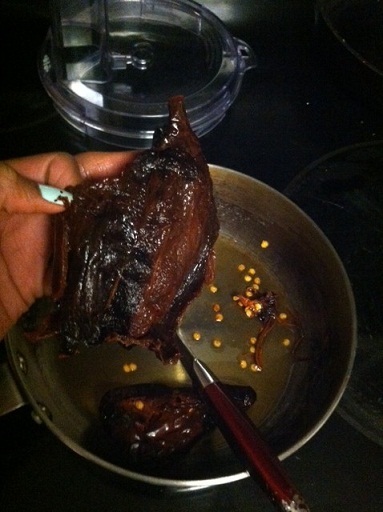 The glaze was so good… I need to find more recipes to use it.